Posted on March 6, 2015 at 1:56 pm. You can play pokies at Royal Vegas Casino using its free specialised gaming software, downloadable for free; it saves onto your computer and gives full access to its entire range of casino games, for free play or for real money. 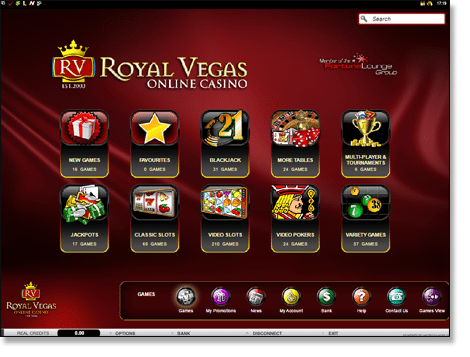 However, you can also play a lot of games at Royal Vegas instantly with its instant play suite, which loads directly through Web browsers via Flash plugins. Recently, the instant-play side of things at Royal Vegas Casino has had a serious makeover. There have been major changes that have improved the player’s gaming experience. If you don’t like downloading and saving additional gaming software and are used to playing casino games instantly, then you should check out the new features. There are still fewer games in the instant playing suite than if you downloaded the gaming software, which let’s you play the entire casino. But now there are many more games you can play instantly and there are continually new games being added to the instant-play selection. At the moment the instant play suite has; 70 classic slots, over 200 video slots, 17 progressive jackpot pokies and a wide variety of other casino games. If you have favourite slots titles or a preferred video poker title you can now save them to the ‘Favourites’ section of your instant play casino. This let’s you find what you’re really after quickly and efficiently, without having to search through all of the gaming titles every time. It helps create a personalised gaming experience that is designed to be exactly what you want. You can now run through listings of the games and a brief and sufficient description of what you can expect from the game will pop up on the side. This helps you discover new games that appeal to you without having to try all of them out. This feature is particularly useful for progressive jackpot games as you can see which progressive games currently have the largest jackpots. The promotional section is kept separate from the main playing suite where the games are hosted so that you can see all of the offers available to you clearly without gaming distractions. It ensures you don’t miss out on any vital deals and promos. Racing For Pinks Online Slots: this is a 5-reel video slot with 243 ways you can win. In Racing For Pinks the Bonus Race icon triggers the bonus game. In the bonus game you select a racer who you think will win, the more correct guesses you make the more races you win and you can win a x175 multiplier. Burning Desire: this is a classic style 5-reel slots game and has 243 ways you can win. In this game the Gold Coin icon unlocks free spins, if you have three Gold Coin icons you win two free spins but if you have five Gold Coin icons you win 100 free spins. Any winnings you make during a free spin round are tripled and free spins can be retriggered during a free spin round. The Rat Pack: is an exciting 5-reel slots game with 30 pay lines. There are two wild symbols in this game, the ‘x2’ symbol will substitute for any other icon to help you form a winning pay line and your winnings for that spin will be doubled. The RAT PACK symbol will also substitute for other symbols to help you form winning pay lines. Sign up and play the best real money online pokies in AUD currency today at Royal Vegas Casino.